I feel it is worthwhile pointing out, given that this is the model discussion thread, that the anomalies, a pretty reasonable guide to pinning down the upper air pattern used correctly and when possible in conjunction with det runs, are not indicating any sustained heat over the UK, and even western Europe, with temps returning about average and possible a little below in Iberia. 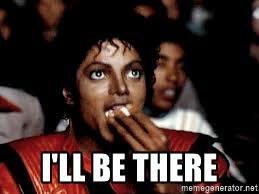 Possible getting under way over Glastonbury weekend. 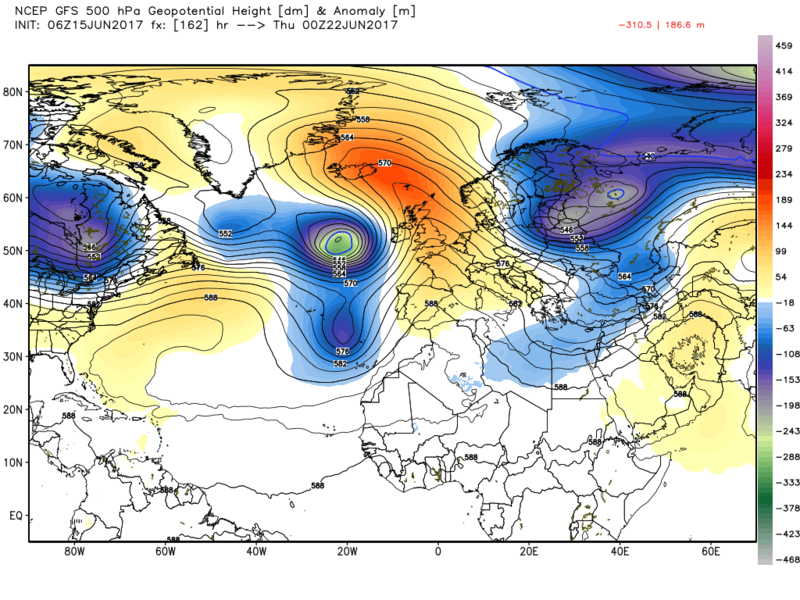 The main features are low pressure over the Arctic with associated troughs Greenland area and eastern Europe, and a weak trough in the eastern Atlantic. Thus a fairly weak westerly upper flow. 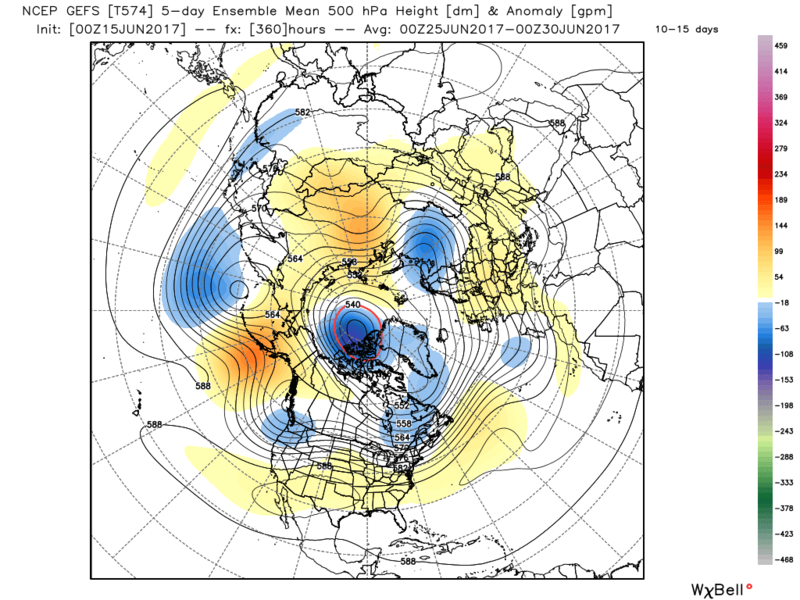 The EPS does differ slightly by suggesting ridging in mid Atlantic thus veering the flow somewhat. 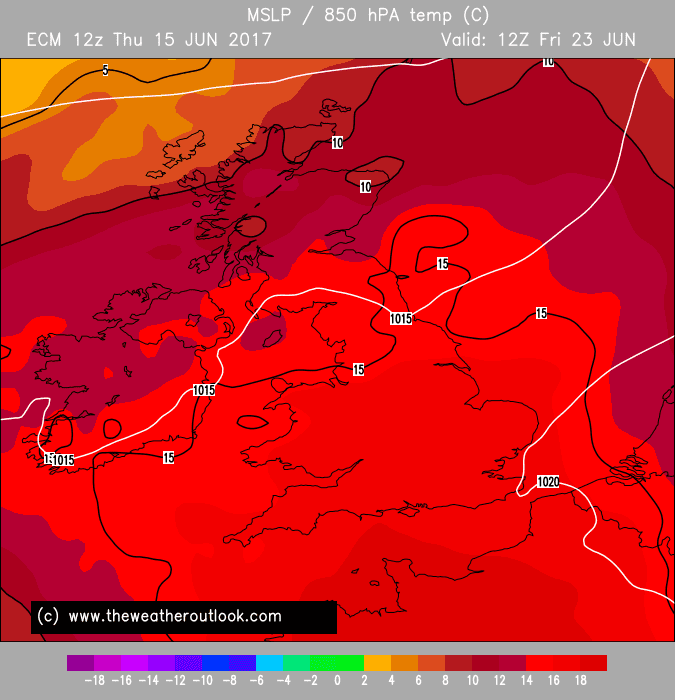 The setup to me is not disimilar to the hot spells of May 08 and 12 although we could well see the hottest second half to June since 2005. 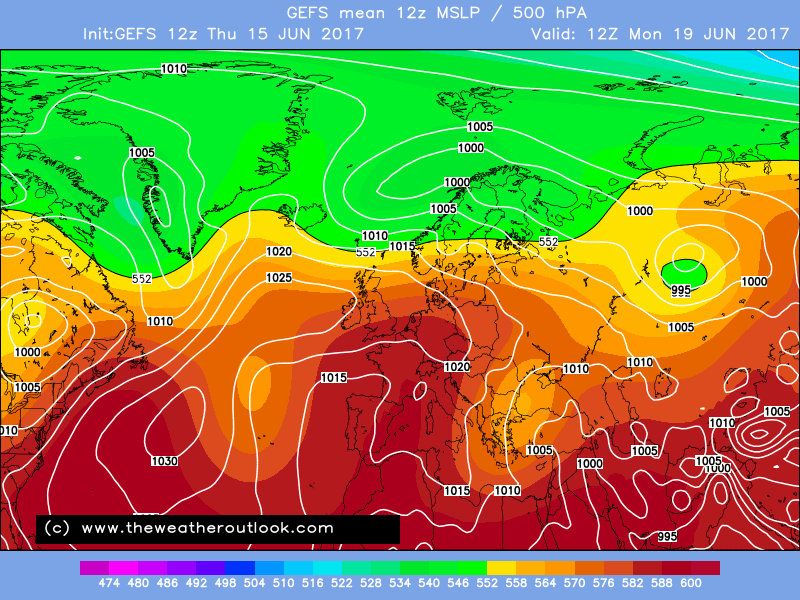 Just done a quick analysis on the both the peak and scope of warmth by the following 4 models; NAVGEM, GEM, ARPEGE & GFS. This is the most widespread in terms of heat and peak of temperatures. It is suggesting the possibility of 32 being reached for both Sunday, Monday & Tuesday. Highest Temps slowly transferring west by Tuesday. Showing the possibility of 30 being reached around the London Area on Sunday (Usual Places like: Heathrow, Northolt & Kew Gardens). 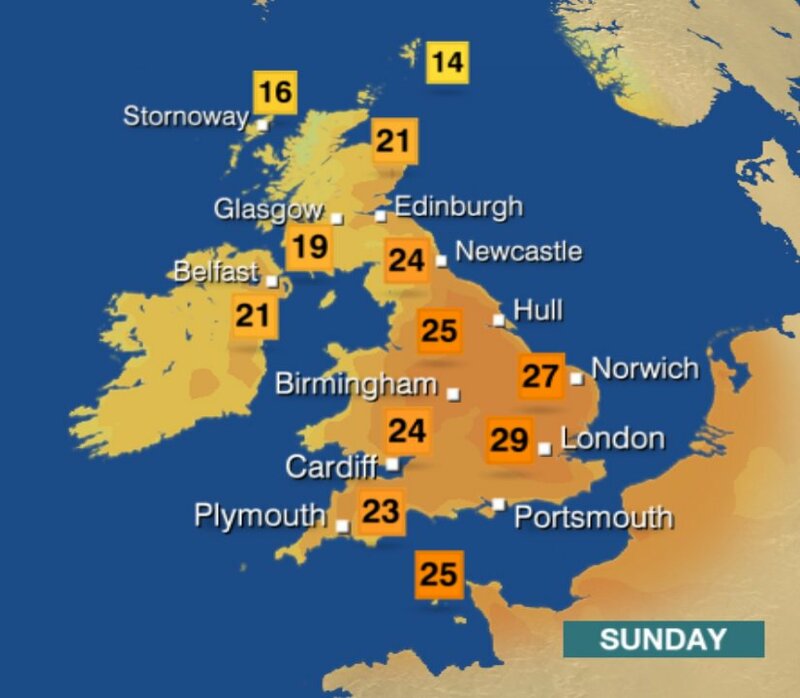 It will be widely 25 - 28 on both Sunday & Monday for southern areas (Including areas of the South West, Midlands & Wales). Likelihood of 29 being reached, once again around the London area. 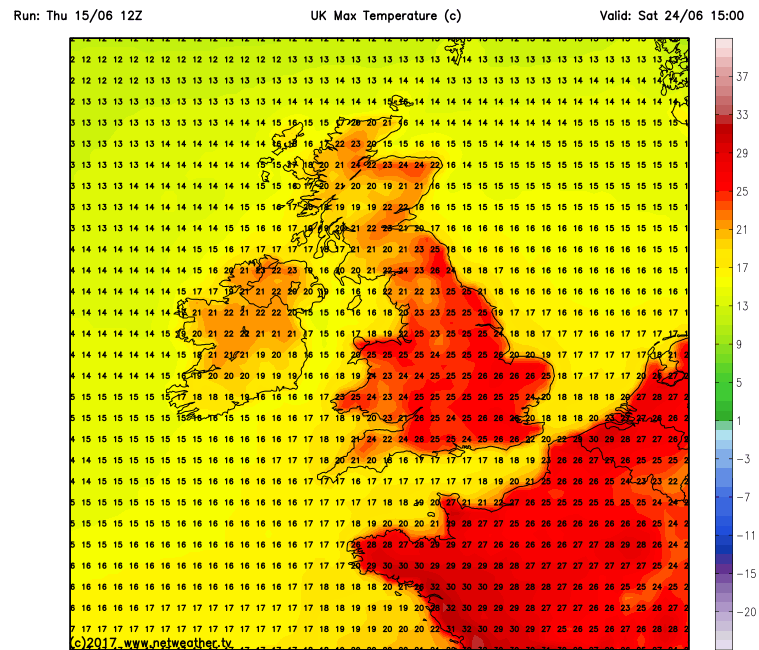 Monday being the warmest day. 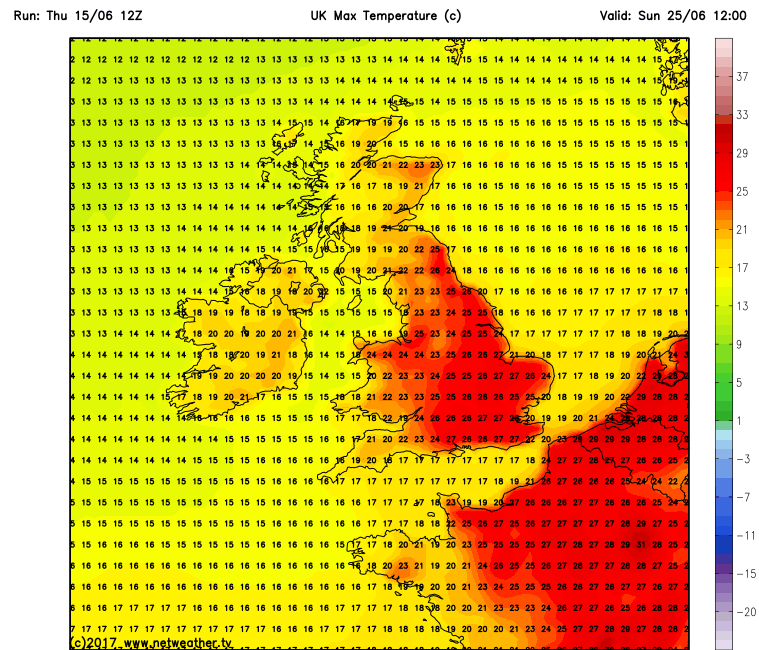 28 being the warmest on Monday around the Southampton area, widely 24 -26 from the North Midlands South. ARPEGE most likely, as it ties in with BBC (Met Office) predictions, NAVGEM most likely overcooking temps (But not out the question), GFS underplaying temperatures a little, especially in peak terms. 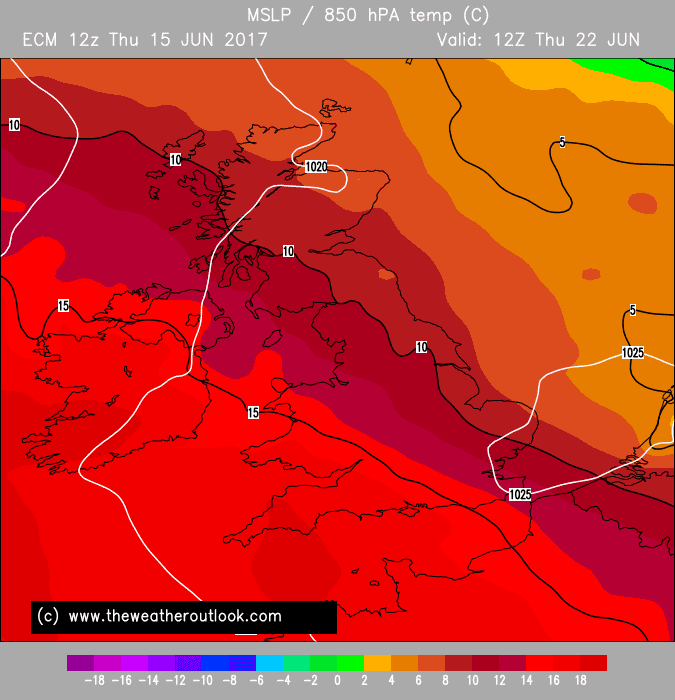 ECM would also likely produce around the 30 degree mark. 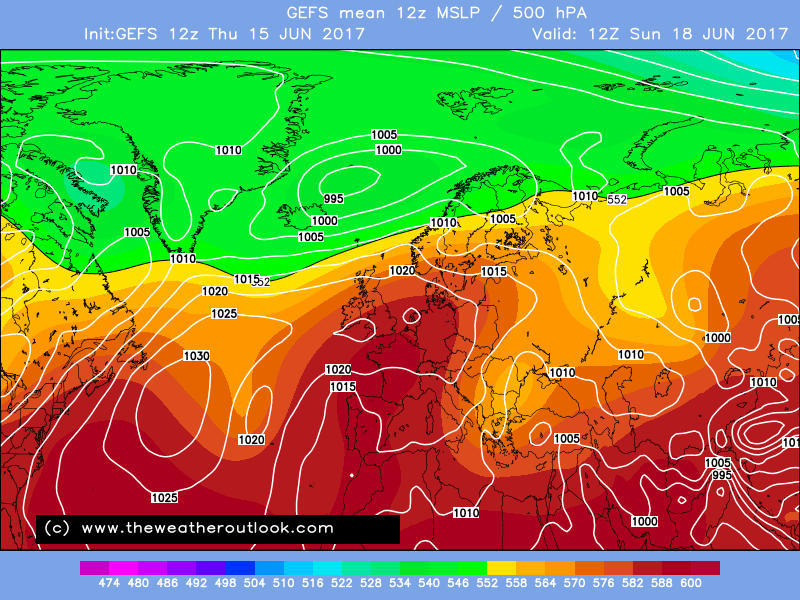 This very latest chart now shows the process of the heat up under way. Currently much of the British Isles in a cooler air mass but by this time tomorrow warmer air will be advancing from the SW. 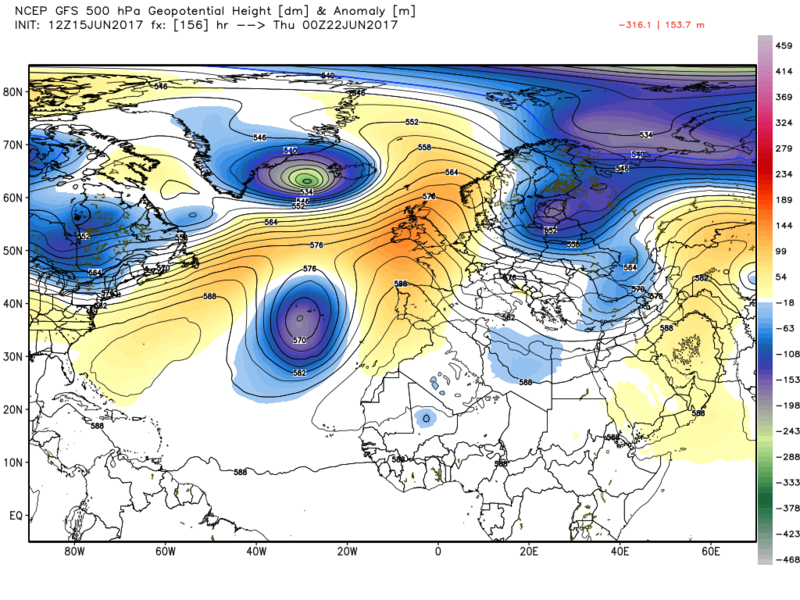 The geo- potential heights show a robust Azores Ridge in development extending towards South Britain. 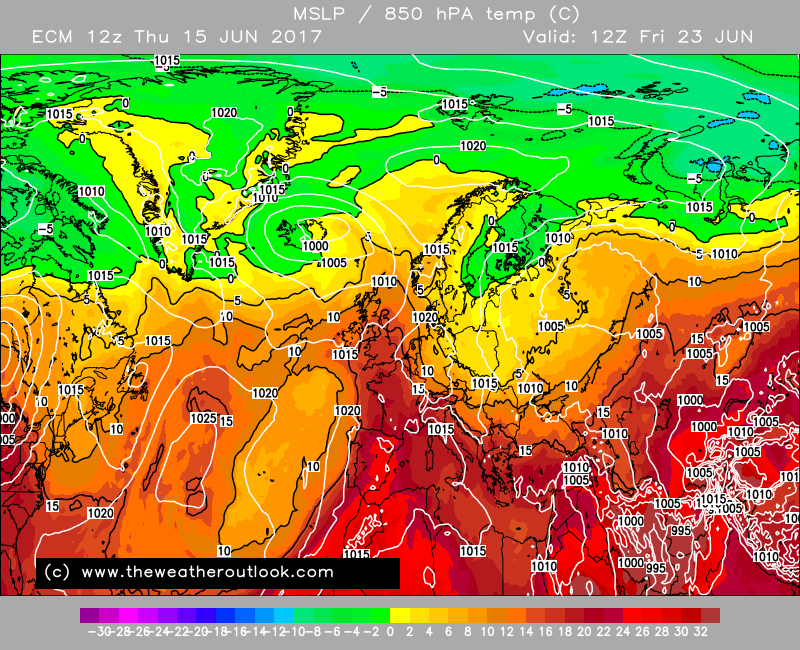 The air mass on its Northern flank is particularly warm with surface air temps shown as high as 25c. Another worthwhile feature is the above normal sea surface temps in the Azores Region ( 2 to 3 c ) anomaly. 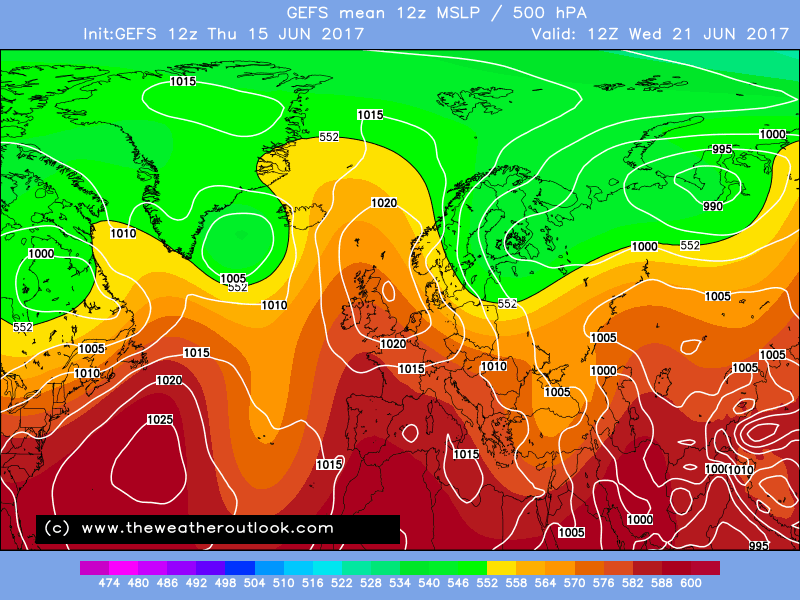 Looking very nice indeed, most of next week could be glorious too perhaps turning very hot by the end of next week again? A long way off mind you. Tuesday perhaps could be a transition day as the high re-aligns, so maybe a dip here before temperatures climb back upwards again towards the weekend. 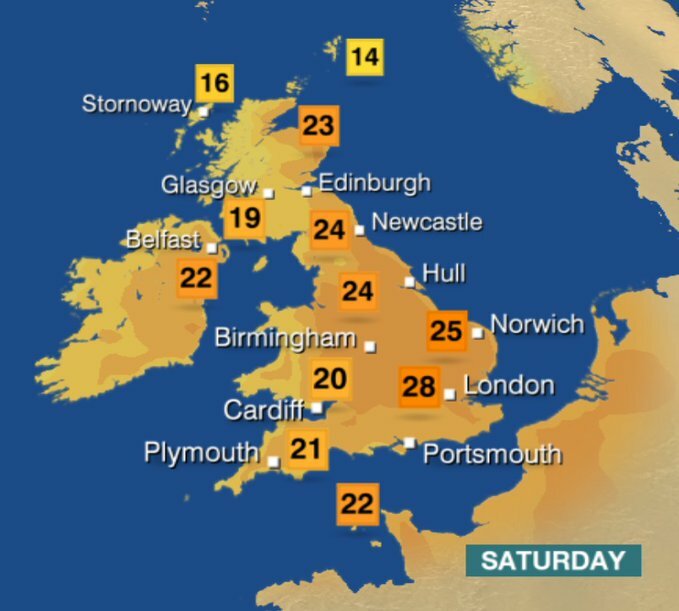 The weekend is looking great across England and Wales, widely mid 20's celsius and perhaps 30-32c in the hottest spots in the south-east by sunday..makes a nice change to see dry, sunny and very warm / hot weather coinciding with a weekend! Looking at the weekend and next week, the GEFS 12z mean shows high pressure in charge with warm / very warm settled conditions across most of the uk with plenty of sunshine to come.!  Edited June 15, 2017 by Frosty. 1995 probably more appropriate - uneventful/poor June, turning hot at the end, leading to one of the best summers of our time. 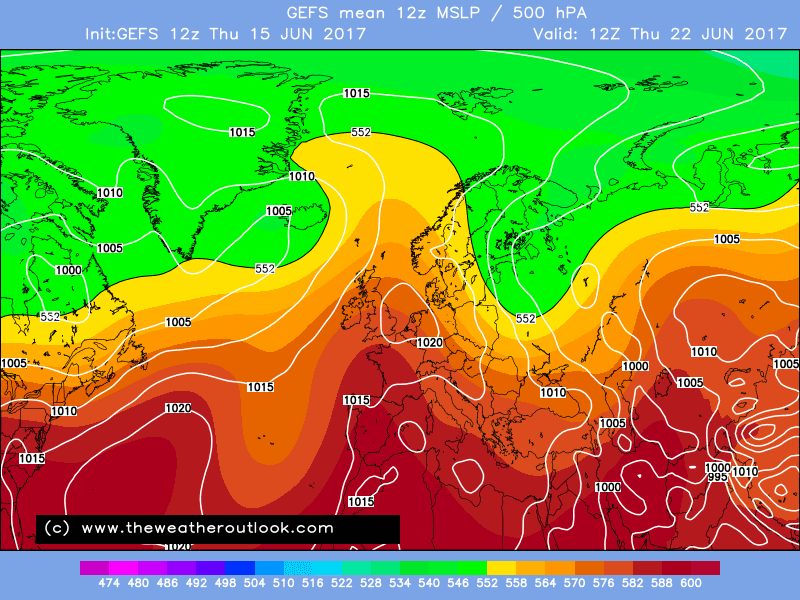 Not that I expect anything like 1995 this year, but I do hope July and August are settled and warm at least. Also including the North of the UK for once. The weather we had in May has jinxed us and the models don't like us anymore. 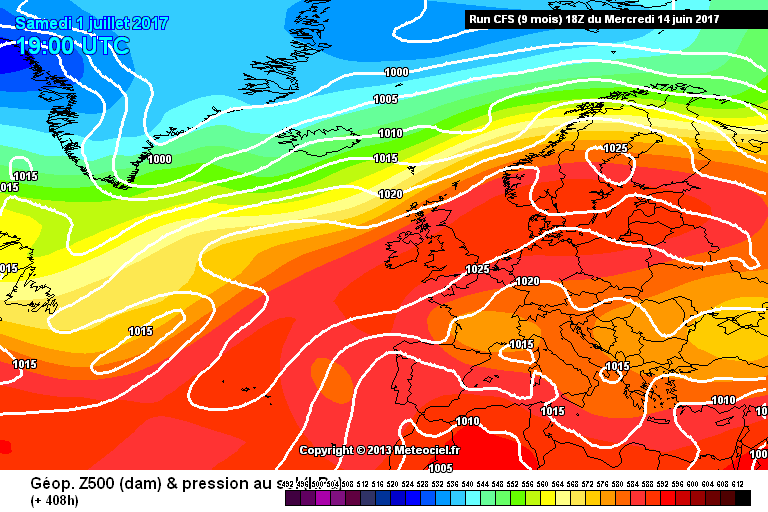 ECM singing from the same sheet too - things cooling slightly before really turning hot again later next week, before finally things become more mobile. Enjoy the stretch of weather folks, could end up being one of the best of the summer! Or is it merely a precursor to a summer to remember? But if you thought you might get in at the bottom of the market, you're too late! Coz I already bought 'em all! 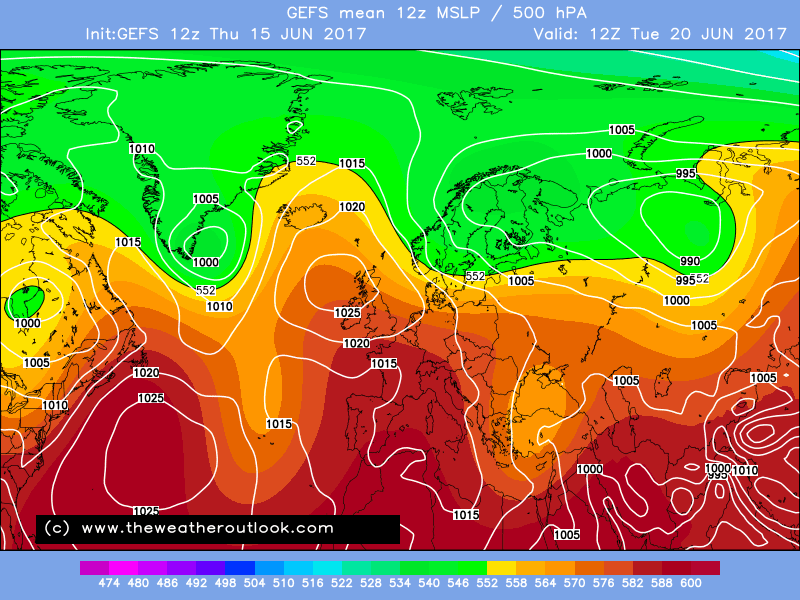 I think it's great that the Ecm 12z gives us another pulse of heat next week. 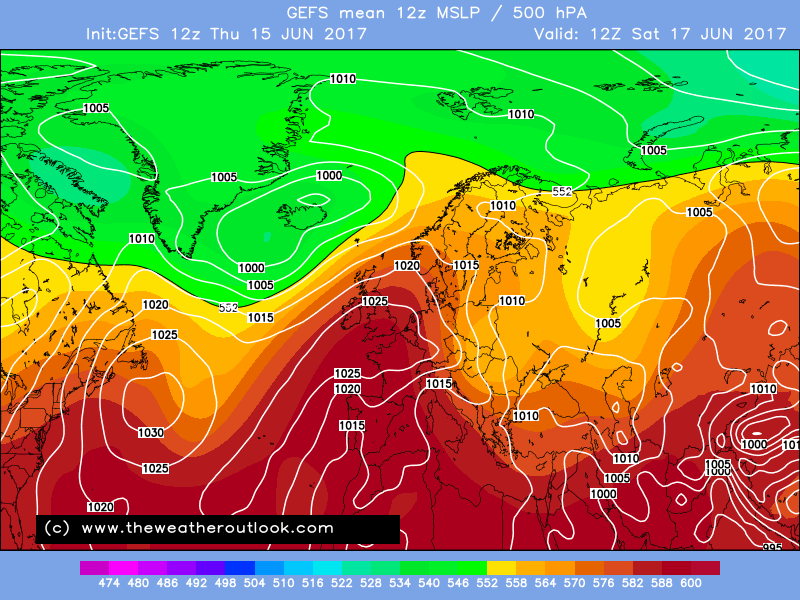 Really for the south of the uk this is a fantastic spell of summery weather coming up! Not what I get, must not be latest one, for fun of course, but Murray under the roof! The old CFS sure does move along doesn't it? Was downloaded immediately before posting it but I guess it updated just to trick me! Anyway, no point in me worrying about it - I only showed it for a laugh really. Hopefully we can be more confident about the June weather in the immediate offing as we could do with losing the wind and clouds in this neck of the woods! 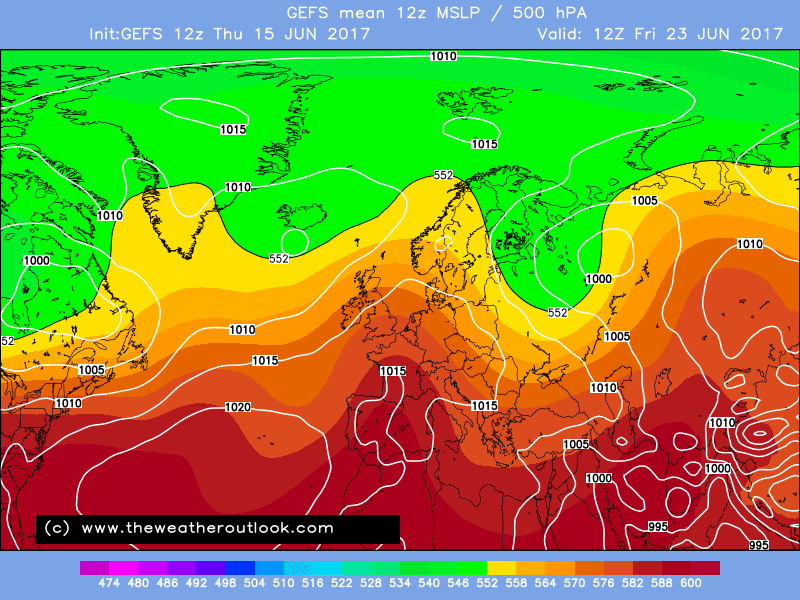 Might make 20c or even 21c in Pembrokeshire or perhaps we can get a waft of that properly hot air from the SE if we're really lucky! 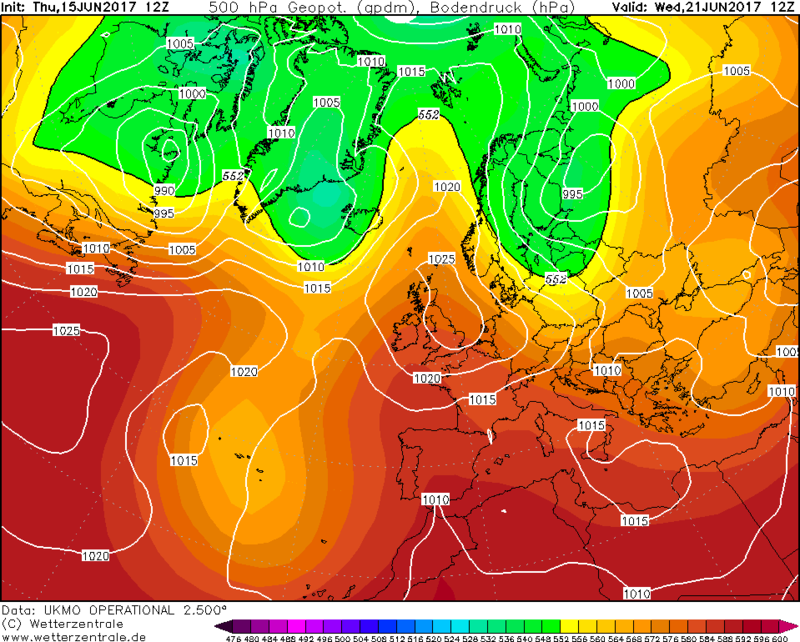 Us Glastonbury festivalgoers may well be hopecasters but tonight we find ourselves respecting most peoples' High Pressure dominated, dryness dominated and even heat-likely prognoses of possibilities for next week. Even various latest models seem to be in reasonable levels of agreement by now. Which is not what I saw last night and yesterday. So yes, usual FI health warnings apply but!!! Van and us are away and offline from 10 am-ish tomorrow, until Tuesday 27th or Wednesday 28th June. I'll have to rely on Carol Kirkwood and other crews' smartphones during the build up to and actual fest. Someone mentioned 1995. Not impossible that G2017 could be the hottest G-fest since that notoriously hot year. Some onsite really do not like dust, heat, ridiculous sunshine. Thankyou all for tolerating my usual late June obsessions folks. And if any LP influence reasserts itself, can that NOT come from a SWerly direction please? Both GFS and Euro want the breakdown at day 8/9 tonight however i would not be shocked if that was pushed back.